[UPDATE. Dec. 2013. The summary of 2013 of WUWT has just been released and the number of pageviews of WUWT has dropped. In 2012 WUWT had 36 million page views, in 2013 only 35 million. Not a large drop, but a good beginning. And it should be noted that a constant readership leads to reductions in ranking as the internet is still growing fast. Thus these number are a clear contrast to the increases in ranking that Anthony Watts announced below. Anthony Watts pretends to be beside himself with joy. 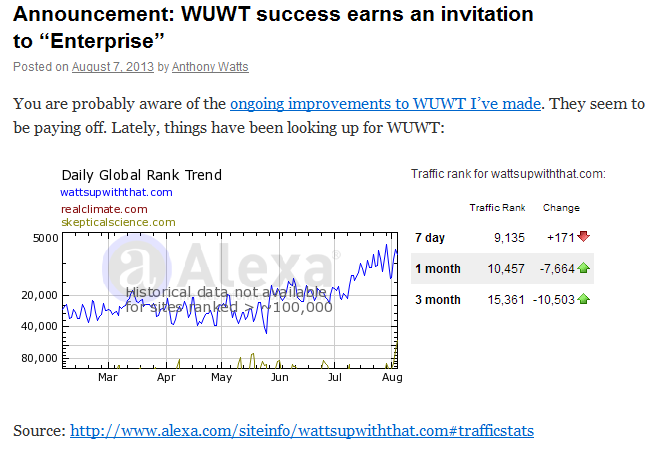 WUWT has an enormous increase in traffic!! In his post Announcement: WUWT success earns an invitation to “Enterprise” he writes: "You are probably aware of the ongoing improvements to WUWT I’ve made. They seem to be paying off. Lately, things have been looking up for WUWT:" and shows this graph. With such an increase in the quantity of readers, why care about quality? Thus suddenly it is no longer a problem that Wotts Up With That Blog (now called: And Then There's Physics) clarifies the serious errors on WUWT daily. @CollinMaessen @wottsupwiththat His every post "Watt about..." is an attack on my name. But I don't care. Success is best revenge. The WUWT regulars are cheering. JimS: Congrats, Anthony Watts. 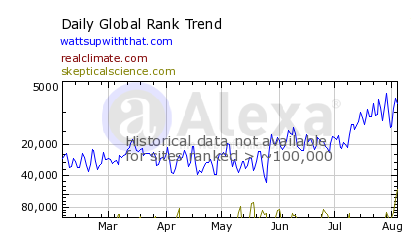 I see that your blog stats have arisen to the level that the AGW alarmists wished the temperatures would also arise to confirming their folly. John Whitman: The extraordinary ranking of your venue is the best kind of positive energy feedback loop to increase stimulation of critical independent thinkers in every country. You and everyone of them can draw rejuvenating intellectual energy from it. Wow. George Lawson: The AGW crowd will see this as another nail in their coffin! Almost as painful as this year’s Arctic ice melt. Stephen Brown: Congratulations! I bet that the rise and rise of WUWT is causing a certain amount of underwear wadding amongst the Warmistas! But is the number of WUWT readers really increasing? A first indication that this is not the case, is that Anthony Watts did not really write it explicitly. His post and the plot certainly suggest it and he did not correct the people commenting that clearly thought so, but Watts did not explicitly write so. That should make one suspicious. A second indication is that Watts is very touchy about it. When Collin Maessen, as someone working in IT, pointed out to Watts on Twitter that, Alexa is not very reliable, the response is that Watts blocks Maessen on Twitter. Tamsin Edwards, what is advocacy? Tamsin Edwards has started a discussion on advocacy by scientists. A nice topic where everyone can join in and almost everyone has joined in. While I agree with the letter of of her title: Climate scientists must not advocate particular policies, I do not agree with the spirit. If you define a climate scientist as a natural scientist that studies the climate, it is clear that such a scientist is not a policy expert. Thus when such a scientist has his science hat on, he is well advised not to talk about policy. However, as private citizen also a climatologist naturally has freedom of expression; I will keep on blogging on topics I am not an expert on, including (climate) policy. Other scientists may be more suited to give policy advice (answer questions from the politicians or the public on consequences of certain policies) or even to advocate particular policies (develop and communicate a new political strategy to solve the climate problem). Are hydrologists, ecologists, geographers and economists studying climate change impacts climatologists? They surely would have more to say about the consequences of certain policies. Some scientists focus their work on policy. If that is mainly about climate policy, does that make the following people climatologists? They are certainly qualified to publicly talk about climate policy. For example, Roger Pielke Jr., with his Masters degree in public policy and a Ph.D. in political science. I guess he will keep on making policy recommendations. Gilbert E. Metcalf and colleagues (2008) studied carbon taxes in their study, Analysis of U.S. Greenhouse Gas Tax Proposals and probably did not do this to have their study disappear in an archive. Wolfgang Sterk of the Wuppertal Institut suggests to change the global cap-and-trade discussion to jointly stimulating innovation towards a sustainable economy (unfortunately in German). Sounds close to my suggestion to break the deadlock in the global climate negotiations. One thing should be clear, science and politics are two different worlds. Politics is about comparing oranges and apples, building coalitions for your ideas and balancing conflicts of interest. 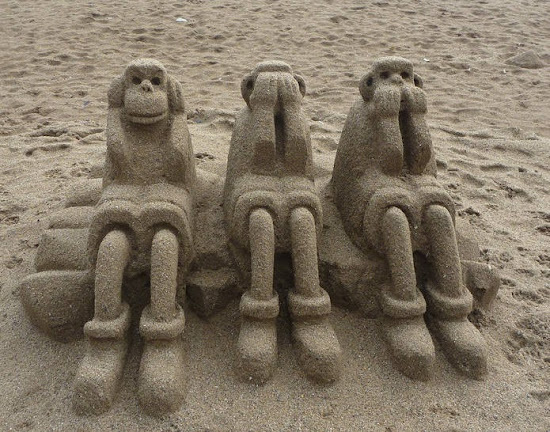 Politicians are used to deal with ambiguity and an uncertain future. Natural science is about comparing like with like. However, you cannot add up lives, health, money and quality of life. Science can say something about implications (including error bars) of a policy with respect to lives, health, money and maybe even quality of life if you define it clearly. The politician will have to weight these things against each other. Science is also about solving clear crisp problems or dividing a complex problem in multiple such simple solvable ones.